A Makeup & Beauty Blog – Lipglossiping » Blog Archive Spend vs Save? Remedies for that morning after the night before! If you’re in the UK, happy Bank Holiday weekend! It’s like, the last one until Christmas, so make the most of it. I thought it might be rather apt to share a couple of hangover remedies on the blog today. Nope, we’re not talking three rashers of bacon and a fried slice (although, I wouldn’t say no)… I’m talking about being prepared and getting your supplements in order! Bet you can’t guess which one is the cheapest can you? 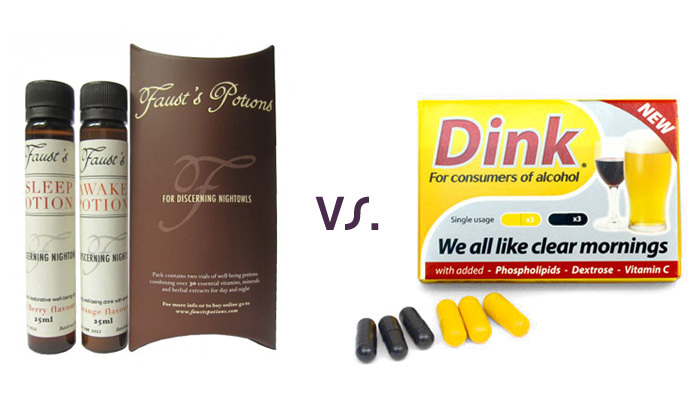 Faust’s Potions (£5.99, cultbeauty.co.uk) promises to deliver a two-step approach to a heavy night out. Incorporating a blend of vitamins, minerals and herbal extracts to gently stimulate and assist alertness throughout the day (or a restful night’s sleep depending on which potion you take). Reviews on Cult Beauty are positive and the uber cute vials remind me very much of something straight out of Alice in Wonderland! Dink (£2.99, dink.co.uk) may lose out in the style awards but it more than makes up for it with its appealable price tag. Combining Phospholipids, Amino Acids, Vitamin C, Vitamin B’s and Dextrose, the capsules (you take all of those pictured) will help supplement the body whenever alcohol is consumed and replenish lost resources that will help aid liver recovery and speed up the breakdown of acetaldehyde, a toxic by-product of alcohol metabolism. Of course… neither of these remedies should give free license to act like a bellend (YOLO etc.) and drink yourself into a stupor. But, if you’re the kind of poor soul (obviously did something heinous in a previous life) who does suffer the most ungodly of hangovers, these might just make your return to the land of the living, that little bit more bearable! What are your favourite cures for the morning after the night before? Mild over-indulgence is best treated with painkillers, a lie-in and a roast dinner, followed by an excess of Swiss Roll and tea and a nap on the sofa while ‘watching’ Columbo. God, I think the hangover would be worth it just to experience your cure Lisa!